The Languedoc-Roussillon region (Languedoc-Roussillon Property Guide) sits in the centre of southern France, and, with the exception of the Lozère department (Lozère Property Guide), lies mainly along the Mediterranean between Spain and Provence (Provence-Alpes-Côte d'Azur Property Guide). The region is well known and loved for its wines which have gained in popularity both at home and abroad in recent times. Languedoc wines can be found on the shelves of wine shops all over Britain and now often also appear in good restaurants. There are five main appellations in Languedoc-Roussillon, and these are: Coteaux de Languedoc, Corbières AOC, Faugères, Minervois AOC and Saint Chinian AOC. However, within these big five, there are many sub appellations, with distinctive characteristics. Hence the situation, which is still undergoing changes, can become quite confusing as new appellations are added and old ones altered. However, it is not necessary, unless you wish to study the sommeliers art and become a wine expert, to have a detailed knowledge of the wines in order to enjoy them. The best way to find the ones you like is simply to try them, and there are many ways of doing exactly this. Of course, a good selection of regional wines is found on the shelves of every supermarket and general shops, and this is certainly an easy way to pick up some inexpensive bottles and get tasting. However, if you want to discover a little more about the wines, you could try visiting specialist wine caves, found in most towns and even in villages in notable wine producing areas, where the proprietor will be very happy to help you find something suitable for every taste and occasion. Street markets and night markets offer another chance to get "up close and personal" with locally produced wines. Other possibilities include visiting local direct ventes, shops which are attached to vineyards and which sell and offer tastings of their own wines. Again, the owners are very pleased to tell you about their wines and can be quite generous with the tastings too, so be careful if driving! Some larger wine estates will arrange vineyard tours as well as tastings, and it is also possible to attend courses that take learning about the wines even further. Of course, there are many wine experts in the Languedoc, and there is no substitute for the right advice from an expert if you really want to understand the fine art of the winemaker, or even of the wine drinker! But, if all this sounds a little daunting, and all you really want is to be pointed in the right direction to find a good bottle to share with friends or to enjoy on the terrace in the evening sunshine, then you can't go wrong with one of these. Limoux (Limoux Property Guide), a market town in the Aude department, is the very proud producer of sparkling wines called Crémant de Limoux and Blanquette de Limoux. Speak to any of the producers and they will tell you that this delicious sparkling wine has a long and distinguished history, and many claim it is the first and the truest champagne. The story (which has some substance) is that the wines were first produced by Benedictine monks in the little village of St Hilaire, which lies just outside the town of Limoux. The wines are made by the traditional "méthode champenoise", as used now in the Champagne region to create that most famous of sparkling wines. There is still, at times a residual bitterness among the wine makers of Limoux that their sparkling pride has been eclipsed by the wines of the Champagne region! Blanquette (the name means "little white" in Occitan) comes in several varieties. The Méthode Ancestrale is usually sweetish, suitable for apéros, the Demi Sec is less sweet but still not as dry as the Brut, which most closely resembles the champagne that most of us know. The Crémant is similar but uses a different combination of grapes. All of them are delightful, bear comparison with "the real thing" and are far, far cheaper. It is possible to buy a very good bottle of Blanquette for around five Euros at the time of writing. Languedoc-Roussillon is not really known for its white wines (other than the sparkling wines from Limoux), and it has to be said, there are some that are not very good. However, the region's most prestigious still white wine is Picpoul de Pinet. It comes from quite a small area, in the Hérault department (Hérault Property Guide) just inland from the Etang de Thau, one of the salt lagoons that characterise this part of the Mediterranean coast. This wine is gaining recognition and respect rapidly and really is lovely. It's a slightly acidic, citrusy wine, light enough for lunch times and perfect with fish or seafood. Other whites are a little more hit and miss, but there are some decent ones under the Minervois AOC, and, perhaps surprisingly, in the Pays Catalanes, from the Roussillon region, normally thought of as a producer of full bodied reds. Perfect summer drinking, the Languedoc offers up some lovely, inexpensive options for lovers of life in the pink. As a general rule, the best rosés of this region are quite pale and clear in colour, quite unlike the deep cerise coloured rosés that are usually served in the UK. Think light salmon, rather than cherry. Rosés are produced in many wine areas of the Languedoc, but look out for the ones under the Faugères appellation, which can be excellent (Faugères Property Guide). In fact, one of these (Domaine de Météore, Les Léonides Rosé 2009, Faugères) was listed in the Sunday Times list of the best wines, chosen by respected wine buff Jancis Robinson. If you want a pleasant and very light rosé, try the Gris Vin de Pays from the Hérault. Technically a Gris and not a Rosé (all rosé wines are made from black grapes, the colour depending on the variety of grape and the length of time the skin is left on to soak, not, as goes the popular belief, a blend of black and white grapes), this is very easy summer drinking. It is unsophisticated but goes down beautifully, chilled on a balmy evening. The price is also remarkable, being all of around eight Euros for five litres. If you love red wines you can really go to town in the Languedoc-Roussillon region. This is where the region really excels, with glorious, robust, full bodied reds encouraged to perfection by the stony, Mediterranean soils and relentless summer heat and sunshine. Everyone will have his or her own favourite, but if you don't know where to start, and really enjoy a powerful red, try a Fitou, perhaps choosing the excellent Rocflamboyant La Grande Reserve 2004 for a really superb example. A mid priced Corbières (Corbières Property Guide) is another popular choice for lovers of big, spicy reds, and in fact, a perfectly drinkable Corbières can be found for as little as two Euros. (Durban Corbières Property Guide, Lézignan-Corbières Property Guide.) Saint Chinian wines are also highly respected (Saint Chinian Property Guide), and it is hard to make a bad choice of these. In addition to the recommended rosé above, Faugères AOC offers some brilliant rich reds, produced from grapes grown at high altitude on well drained soil. 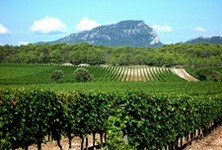 The wines of the Languedoc are as diverse in character as the region's countryside and seaside. In wine terms, everything is possible here, and the local wines can happily take you through an entire evening, beginning with a glass or two of bubbly Blanquette as an aperitif, a crisp white Picpoul de Pinet with the fish course, a powerful spicy Fitou or Corbières red to accompany the main and a sweet glass of Muscat de Rivesaltes making a perfect partner for the dessert. In short, its wines are a very good reason to settle in the Languedoc! Festivals in France - celebrate the Languedoc-Roussillon way!